"Petal Floor Lamp in Soft Brass with Bronze Mirror Base and Silk Shade Designer: Barbara BarryHeight: 58.25"" Width: 17"" Base: 7"" x 12"" Rectangle Socket: E26 Dimmer Wattage: 150 A Shipping Info: Please note, quick ship items ship within 5 - 8 business days. Depending on the quantity, finish and fixture selected lead times and estimated delivery schedule may vary. Our customer service team will contact you within 3-5 business days with an estimated delivery date. In a rush? Please contact us viaemailor 888.338.8111 for availability. *This item is excluded from sale events and not available for additional discounting or promotional offers." "Petal Floor Lamp in Soft Silver with Smoke Mirror Base and Silk Shade Designer: Barbara BarryHeight: 58.25"" Width: 17"" Base: 7"" x 12"" Rectangle Socket: E26 Dimmer Wattage: 150 A Shipping Info: Please note, quick ship items ship within 5 - 8 business days. Depending on the quantity, finish and fixture selected lead times and estimated delivery schedule may vary. Our customer service team will contact you within 3-5 business days with an estimated delivery date. In a rush? Please contact us viaemailor 888.338.8111 for availability. *This item is excluded from sale events and not available for additional discounting or promotional offers." "Petal Floor Lamp in Bronze with Bronze Mirror Base and Silk Shade Designer: Barbara BarryHeight: 58.25"" Width: 17"" Base: 7"" x 12"" Rectangle Socket: E26 Dimmer Wattage: 150 A Shipping Info: Please note, quick ship items ship within 5 - 8 business days. Depending on the quantity, finish and fixture selected lead times and estimated delivery schedule may vary. Our customer service team will contact you within 3-5 business days with an estimated delivery date. In a rush? Please contact us viaemailor 888.338.8111 for availability. *This item is excluded from sale events and not available for additional discounting or promotional offers." 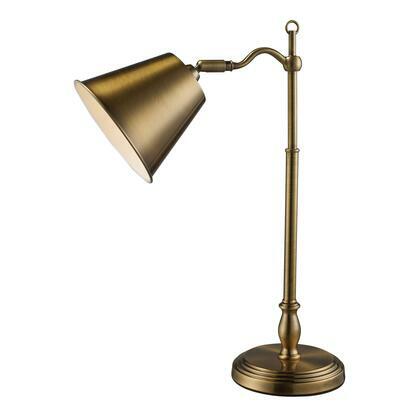 "Simple Adjustable Table Lamp in Soft Brass with Silk Banded Shade Designer: Barbara BarryHeight: 26"" - 33.5"" Width: 15"" Base: 8"" Round Socket: E26 Dimmer Wattage: 150 A TBD Shipping Info: Please note, quick ship items ship within 5 - 8 business days. Depending on the quantity, finish and fixture selected lead times and estimated delivery schedule may vary. Our customer service team will contact you within 3-5 business days with an estimated delivery date. In a rush? Please contact us viaemailor 888.338.8111 for availability. *This item is excluded from sale events and not available for additional discounting or promotional offers." "Simple Floor Lamp in Soft Brass with Silk Banded Shade Designer: Barbara BarryHeight: 62.5"" - 80"" Width: 19"" Base: 12"" Round Socket: E26 Dimmer Wattage: 150 A Shipping Info: Please note, quick ship items ship within 5 - 8 business days. Depending on the quantity, finish and fixture selected lead times and estimated delivery schedule may vary. Our customer service team will contact you within 3-5 business days with an estimated delivery date. In a rush? Please contact us viaemailor 888.338.8111 for availability. *This item is excluded from sale events and not available for additional discounting or promotional offers." "Simple Floor Lamp in Soft Brass with Silk Scalloped Shade Designer: Barbara BarryHeight: 62.5"" - 80"" Width: 22"" Base: 12"" Round Socket: E26 Dimmer Wattage: 150 A Shipping Info: Please note, quick ship items ship within 5 - 8 business days. Depending on the quantity, finish and fixture selected lead times and estimated delivery schedule may vary. Our customer service team will contact you within 3-5 business days with an estimated delivery date. In a rush? Please contact us viaemailor 888.338.8111 for availability. *This item is excluded from sale events and not available for additional discounting or promotional offers." "Simple Scallop Table Lamp in Soft Brass with Silk Shade Designer: Barbara BarryHeight: 26"" - 33.5"" Width: 15"" Base: 8"" Round Socket: E26 Dimmer Wattage: 150 A Shipping Info: Please note, quick ship items ship within 5 - 8 business days. Depending on the quantity, finish and fixture selected lead times and estimated delivery schedule may vary. Our customer service team will contact you within 3-5 business days with an estimated delivery date. In a rush? Please contact us viaemailor 888.338.8111 for availability. *This item is excluded from sale events and not available for additional discounting or promotional offers." "Swing Table Lamp in Soft Brass with Silk Shade Designer: Barbara BarryHeight: 21.25"" Width: 11"" Base: 8"" Round Socket: E26 Keyless w/ Line Switch Wattage: 75 A UL Only Shipping Info: Please note, quick ship items ship within 5 - 8 business days. Depending on the quantity, finish and fixture selected lead times and estimated delivery schedule may vary. Our customer service team will contact you within 3-5 business days with an estimated delivery date. In a rush? Please contact us viaemailor 888.338.8111 for availability. *This item is excluded from sale events and not available for additional discounting or promotional offers." Add a contemporary feel to any room with these attractive brushed nickel touch lamps. Touch controls with 4 settings (Low Medium High Off). The fabric shades complete this modern look. Perfect lamp for bedroom night tables. We believe that lighting is like jewelry for your home. Our products will help to enhance your room with chic sophistication. "Bradford Large Table Lamp in Mirror and Soft Brass with Cream Linen Shade with Soft Brass Designer: kate spade new yorkHeight: 29.25"" Width: 19"" Base: 3.5"" x 12.75"" Rectangle Socket: E26 In-Line Switch Wattage: 100 ASpec Sheet Assembly Guide Shipping Info: Please note, quick ship items ship within 5 - 8 business days. Depending on the quantity, finish and fixture selected lead times and estimated delivery schedule may vary. Our customer service team will contact you within 3-5 business days with an estimated delivery date. In a rush? Please contact us viaemailor 888.338.8111 for availability. *This item is excluded from sale events and not available for additional discounting or promotional offers." "Silhouette Straight Table Lamp in China White and Soft Brass with Silk Shade Designer: Barbara BarryHeight: 30.75"" Width: 16"" Base: 6.75"" Round Socket: E26 Dimmer Wattage: 150 A Shipping Info: Please note, quick ship items ship within 5 - 8 business days. Depending on the quantity, finish and fixture selected lead times and estimated delivery schedule may vary. Our customer service team will contact you within 3-5 business days with an estimated delivery date. In a rush? Please contact us viaemailor 888.338.8111 for availability. *This item is excluded from sale events and not available for additional discounting or promotional offers." "Bradford Large Table Lamp in Cream and Soft Brass with Cream Linen Shade with Soft Brass Trim Designer: kate spade new yorkHeight: 29.25"" Width: 19"" Base: 3.5"" x 12.75"" Rectangle Socket: E26 In-Line Switch Wattage: 100 ASpec Sheet Assembly Guide Shipping Info: Please note, quick ship items ship within 5 - 8 business days. Depending on the quantity, finish and fixture selected lead times and estimated delivery schedule may vary. Our customer service team will contact you within 3-5 business days with an estimated delivery date. In a rush? Please contact us viaemailor 888.338.8111 for availability. *This item is excluded from sale events and not available for additional discounting or promotional offers." "Stylus Large Angled Table Lamp in Dark Walnut and Soft Brass with Linen Shade Designer: Barbara BarryHeight: 33"" Width: 16"" Base: 10"" Round Socket: E26 Dimmer Wattage: 75 A Shipping Info: Please note, quick ship items ship within 5 - 8 business days. Depending on the quantity, finish and fixture selected lead times and estimated delivery schedule may vary. Our customer service team will contact you within 3-5 business days with an estimated delivery date. In a rush? Please contact us viaemailor 888.338.8111 for availability. *This item is excluded from sale events and not available for additional discounting or promotional offers." "Perfect Pleat Hanging Shade in Soft Brass with Silk Shade Designer: Barbara BarryO/A Height: N/A Min. Custom Height: N/A Width: 23"" Canopy: 6.5"" Round Socket: 2 - E26 Keyless Wattage: 2 - 75 A Shipping Info: Please note, quick ship items ship within 5 - 8 business days. Depending on the quantity, finish and fixture selected lead times and estimated delivery schedule may vary. Our customer service team will contact you within 3-5 business days with an estimated delivery date. In a rush? Please contact us viaemailor 888.338.8111 for availability. *This item is excluded from sale events and not available for additional discounting or promotional offers." "Perfect Pleat Oval Hanging Shade in Soft Brass with Silk Shade Designer: Barbara BarryO/A Height: N/A Min. Custom Height: N/A Width: 36"" Canopy: 5"" x 23.5"" Rectangle Socket: 4 - E26 Keyless Wattage: 4 - 40 A Shipping Info: Please note, quick ship items ship within 5 - 8 business days. Depending on the quantity, finish and fixture selected lead times and estimated delivery schedule may vary. Our customer service team will contact you within 3-5 business days with an estimated delivery date. In a rush? Please contact us viaemailor 888.338.8111 for availability. *This item is excluded from sale events and not available for additional discounting or promotional offers." "Perfect Pleat Tall Hanging Shade in Soft Brass with Silk Pleated Shade Designer: Barbara BarryO/A Height: N/A Min. Custom Height: N/A Width: 13"" Canopy: 6.5"" Round Socket: 2 - E26 Keyless Wattage: 2 - 60 A Shipping Info: Please note, quick ship items ship within 5 - 8 business days. Depending on the quantity, finish and fixture selected lead times and estimated delivery schedule may vary. Our customer service team will contact you within 3-5 business days with an estimated delivery date. In a rush? Please contact us viaemailor 888.338.8111 for availability. *This item is excluded from sale events and not available for additional discounting or promotional offers." "Refined Rib Sconce in Ebony Resin and Soft Brass with Silk Shade Designer: Barbara BarryHeight: 16.75"" Width: 7.75"" Extension: 8.5"" Backplate: 4"" x 6"" Rectangle Socket: E26 Keyless Wattage: 75 A Shipping Info: Please note, quick ship items ship within 5 - 8 business days. Depending on the quantity, finish and fixture selected lead times and estimated delivery schedule may vary. Our customer service team will contact you within 3-5 business days with an estimated delivery date. In a rush? Please contact us viaemailor 888.338.8111 for availability. *This item is excluded from sale events and not available for additional discounting or promotional offers." "Reflection Large Hanging Shade in Soft Brass with Silk Shade Designer: Barbara BarryO/A Height: 40"" Min. Custom Height: 23"" Width: 24"" Canopy: 10"" Round Socket: 4 - E26 Keyless Wattage: 4 - 75 A Custom Height Available / Knob is for decorative purposes. Shipping Info: Please note, quick ship items ship within 5 - 8 business days. Depending on the quantity, finish and fixture selected lead times and estimated delivery schedule may vary. Our customer service team will contact you within 3-5 business days with an estimated delivery date. In a rush? Please contact us viaemailor 888.338.8111 for availability. *This item is excluded from sale events and not available for additional discounting or promotional offers." "Reflection Semi-Flush Hanging Shade in Soft Brass with Silk Shade Designer: Barbara BarryO/A Height: 12"" - 14"" Min. Custom Height: N/A Width: 15"" Canopy: 10"" Round Socket: 2 - E26 Keyless Wattage: 2 - 75 A UL Only Custom Height Available Shipping Info: Please note, quick ship items ship within 5 - 8 business days. Depending on the quantity, finish and fixture selected lead times and estimated delivery schedule may vary. Our customer service team will contact you within 3-5 business days with an estimated delivery date. In a rush? Please contact us viaemailor 888.338.8111 for availability. *This item is excluded from sale events and not available for additional discounting or promotional offers."